Electronic Media Students of Anna University, Chennai conducted an Image Audit of five City Post Offices under the guidance of Mr K. Srinivasan, Chairman of Prime Point Public Relations Pvt Limited (Project Guide). This project is part of the 'corporate communication paper' of their studies. 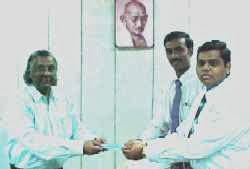 They collected 1256 samples from Park Town, General Post Office, Mount Road, Mylapore and St. Thomas Mount Post Offices. The students themselves presented the report to the Senior Officials of the Tamilnadu Postal Department. Dr U Srinivasa Raghavan, Principal Chief Post Master General and CD being handed over to Principal CPMGother senior officials were present for the presentation. The senior officials sought clarifications on their presentation and were properly explained by the students. Finally the students handed over the copy of their report in the CD format to the Principal Chief Post Master General. Dr U Srinivasa Raghavan, Principal CPMG thanked the students and Project Guide for conducting the Image Audit of City Post offices. He assured the students that he would take steps to rectify the deficiencies pointed out by the customers during the Audit.